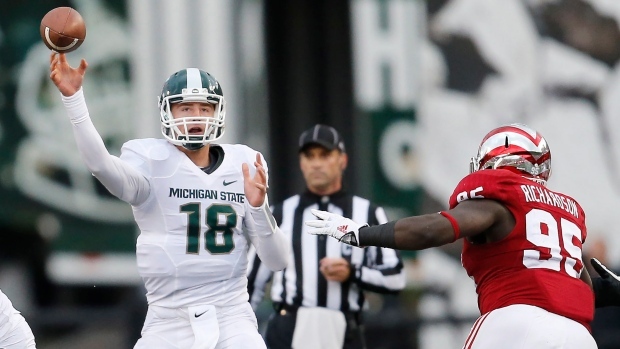 Bloomington, IN - Connor Cook passed for 332 yards with three touchdowns and an interception to lead No. 8 Michigan State to a 56-17 win over Indiana on Saturday. Nick Hill had 178 yards with a touchdown on the ground. Jeremy Langford rushed for 109 yards with three scores and Tony Lippett led all receivers with 123 yards for the Spartans (6-1, 3-0 Big Ten), who have won five straight games. Michigan State's defense, which ranked fifth nationally in terms of yards allowed entering the game, was stout against the pass in this one. Zander Diamont, making his first career start for Indiana, struggled to just 11 yards on 5-of-15 passing, but he did contribute a rushing touchdown. Tevin Coleman, the nation's leading rusher coming in, finished with 132 yards on 15 carries in the setback. Shane Wynn had a rushing score for the Hoosiers (3-4, 0-3), who have lost three of its last four games overall.